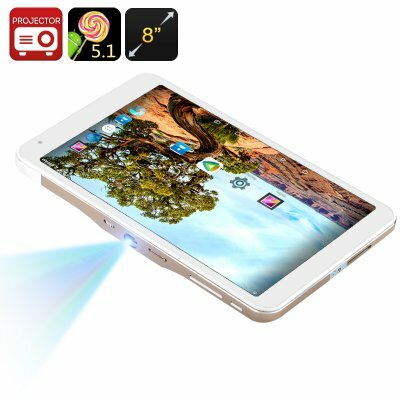 Successfully Added Android Tablet PC + Mini Projector - 8 Inch Tablet PC, 50 Lumen Projector, RK3288 CPU, 2GB RAM, Android 5.1, OTG to your Shopping Cart. This 8 inch projector tablet has the power to turn any room in to a mini cinema. This mini portable tablet with is built in projector lets you do all a tablet can do but with the ability to share the results through its projected display, perfect for the boardroom, classroom or living room. With its 8 inch 1920x1200 resolution screen and innovative integrated projector this tablet has multiple uses for every facet of your life. Enjoy a rich immersive theater experience with the 50 Lumen LED projector that supports 1080p videos and offers a 120 inch projected screen displaying your content on walls or the ceiling. Now you can share videos and movies with your friends on the large screen directly form this portable tablet PC. Running on the Android 5.1 operating system you get all the slick services and Android shortcuts at your fingertips like multitasking proficiency and "OK Google" voice commands. With 32GB of internal storage and OTG allowing you to add extra storage through memory pens and card readers there's no shortage of room for your favorite content and apps from the Google play store. The tablet has front and rear cameras for snapping photos or taking videos and with that projected display its perfect for sharing your favorite holiday shots and memorable moments on a big screen. A built in 5500mAh brings plenty of power to see you through a film or your favorite TV shows, perfect for those long journeys or commutes. This Android Tablet with built in projector comes with a 12 months warranty, brought to you by the leader in electronic devices as well as tablets PCs and mini projectors..